For those who obsess about exactly how their 356 left the factory! I have a 1960 T5 Super 90. I’m trying to determine what radio would have been appropriate for the car. There is no mention of a radio in the Kardex or CoA. There is no radio currently in the dash. There is however an uncovered hole in the dash, what appears to be an antenna wire, and speakers in the kick panels. So I’m guessing this would indicate a dealer, or subsequent owner radio install. Is there a way to determine what that radio would have been? Perhaps based on the size of the opening, speakers, or looking at the wiring / fuse panel? The speakers don’t appear to match what I’m seeing pictured in the Brett Johnson book 356 Porsche: A Restorer's Guide to Authenticity. So maybe it wasn’t even Porsche? P.S. Bonus points to anyone that can advise on the purpose of the 4 screws above the radio opening. WTF?!? If you go to the "Resources" section our website and scroll down to "Vendors" and then to Charlie White's website. You will find a section on identifying Blaupunkt radios. In that section are pictures and model numbers for the various radios installed in the 356. On your car, it looks like the holes for the radio stems have been elongated probably for a previous aftermarket radio installation. Hopefully the stem nuts will cover them up. I believe the speakers may be correct for your car but others with more knowledge will confirm that. The 4 screws? Maybe for some type of event plaque? Mike Wilson wrote: If you go to the "Resources" section our website and scroll down to "Vendors" and then to Charlie White's website. You will find a section on identifying Blaupunkt radios. In that section are pictures and model numbers for the various radios installed in the 356. Thanks for the suggestion. Charlie shows five different Blaupunkt options from the 356-B T-5 Factory Accessory Brochure - February 1960. I'm not sure how to zero in on the correct one. 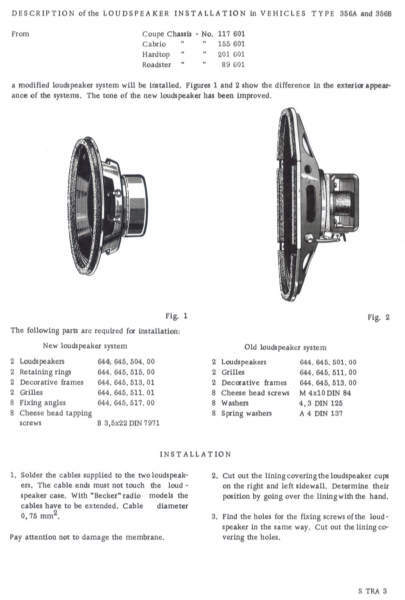 On related good news, Charlie has some literature identifying the oval speakers as available for 356A Thru 356B T-5. So that's a good sign towards originality, as mine is a T5. You are correct. Trying to figure out what radio was installed is basically impossible unless it is noted on the Kardex. The Kardex for my car doesn't list a radio either so I just used what I thought was the most common, the Blaupunkt Frankfurt T series., U.S. version. The beauty of your situation is that you have options and can go with whatever radio might have been installed that year. The challenge is finding a decent one and getting it cosmetically restored and in working order. Interestingly, Becker radios had different shaft alignment than the blaupunkt radios and actually required making the holes oval right from the start. So, it could be that your car had a Becker radio. There are some theories that the football grills that your car has came with blaupunkt radios where the race track style grills came with Becker radios. As stated above, hard to predict what was in the car originally. Most of the Kardex do not have a radio listed, although quite a few have antenna and loudspeaker listed. So some are factory prepped for a radio to be installed, and others it was completely up to the dealer. As Mike says the Blaupunkt Frankfurt US was a common factory item. A period-correct Sapphire I AM radio with the trapezoidal push buttons is an extremely tight fit through the stem holes, but not enough to be hacked out as shown. If the speaker is stamped "LA750" on the magnet frame, then it is a Blaupunkt speaker. "P1018" is a Philips speaker. Maybe the 4 holes are for a rally stopwatch. They were common to mount them to the dash for rallying back in the day. That was the first thing I though of when I saw the screws. Jan Kolm wrote: If the speaker is stamped "LA750" on the magnet frame, then it is a Blaupunkt speaker. "P1018" is a Philips speaker. Hi Jan. Thanks for that nugget. Were radio and speaker brands matched? Meaning if the speaker is Blaupunkt, then the radio probably was too. If the speakers are Philips, then the radio would Sapphire, Becker or Telefunken? As a general rule, matching speakers came with the 356 radio kits. I'm assuming Telefunken, Philips and Grundig radios were only available as aftermarket installations in 1960, so the speakers would have to be purchased separately (Note: Although the Blaupunkt and Philips grilles are much different in appearance, the speakers themselves are virtually identical). However, since Porsche and VW dealerships were frequently collocated under the same roof prior to 1970, the VoA Sapphire I radio may have been offered as an economical, dealer-installed alternative to Blaupunkt or Becker. I do not know if a 356-specific Sapphire I kit was ever offered, but Bendix and/or Motorola did offer the same basic, all-transistor radio for non-VW applications.